Stores Ref. 22c/879, size 3 (71/8 - 7 3/8). The leather is in very good overall condition, completely supple and quite clean. There is minor scuffing and light wear but no damage. Soft verdigris deposits evident on metal parts but these are quite easy to remove with methylated spirit. Faintly embossed with stores reference details. All goggle straps are good and retain most of the original coating on the press studs. The lining has average soiling and is undamaged. Good rubber receiver carriers. The chinstrap is a bit faded/grubby but retains elasticity. Fully wired with a pink flecked dark chocolate coloured loom, type 32 (10A/12443) receivers and black cased bell jackplug. 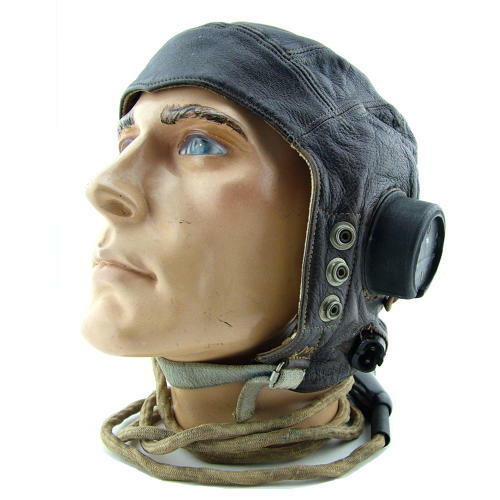 Belonged to DFM winning Spitfire pilot and will be supplied with a copy photograph of him. A good / good '+' used example. Stock code H21977.